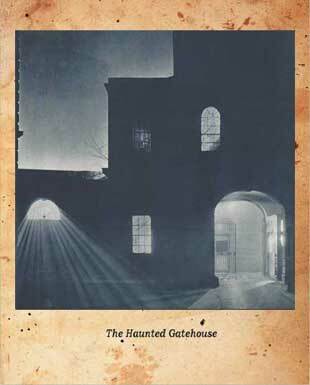 This truly atmospheric haunted London walk explores the hidden and ghostly places of the city as darkness falls. It introduces participants to one of the City's most atmospheric, and most haunted quarters, where you will see some of the most amazingly historic locations imaginable. From churchyards to plague pits; hidden courtyards and narrow alleyways; haunted pubs to Roman ruins; not to mention execution grounds and time-worn churches. And, because your guide is the internationally renowned storyteller and ghost book author, Richard Jones - London's "Master of the Macabre" - you are in for a spine-chilling, thought-provoking experience that skillfully mingles historical facts with masterful storytelling in such a way as to keep you both on edge and entertained throughout the entire duration. The Hidden Horrors Ghost Walk begins in an atmospheric little graveyard where you will stand alongside an ancient tomb as Richard sets the mood for the ghost walk ahead. 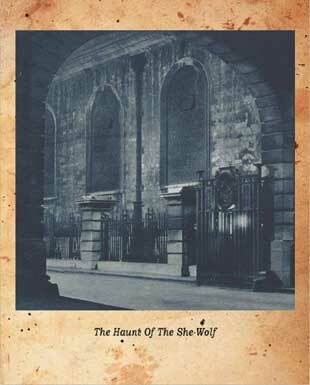 Introductions over, Richard will tell you the story of the "She Wolf of France" and how her flickering shade has been seen drifting amongst the tombstones of the very graveyard in which you are standing. Having pondered the mysteries of this spectral place, the Haunted London walk will move on to a magnificent old church, the bell of which once rang out to signal the commencement of public executions in the square opposite. Indeed, you will hear of some of the strange and bizarre customs that became an integral part of those long ago "execution days" and learn how some of those who ended their days dangling at the end of the hangman's rope have been known to return to the vicinity of their demise as ghosts. 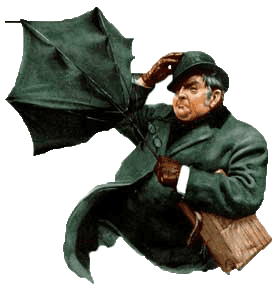 You will also learn how the bells of the church are the ones that, in the rhyme "Oranges and Lemons", are the very bells that ring out and enquire "When will you pay me say the bells of Old Bailey?" But what could possibly be the payment that they require? 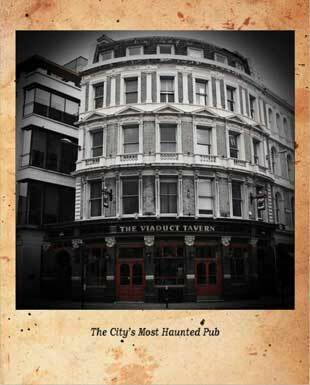 Our next destination is a building that has gained the enviable/unenviable reputation for being the most haunted pub in the city of London. Although we don't actually go inside it, Richard will explain how he has been collecting ghost stories about this particular pub for the last 39 years, and he will give you a whistle stop run down of the ghostly goings on at this spooky location. You will hear about the poltergeist activity that frequently occurs when there is a change of manager. You will hear of the bizarre happening when, on Halloween 1996, a television programme decided to broadcast live from this haunted hostelry, and their medium recede a very strange message from the pub's resident phantom. You will hear of the time, in 1987, that a manager had a decidedly otherworldly encounter with an unseen entity in the pub's cellar. And, Richard will even tell you about the events that unfolded when he led a camera crew down into the tavern's depths whilst filming for Michaela Strachan's Great British Ghosts. Richard will then tell you the chilling story of the nobleman who, in the early 1600's, threw himself to a decidedly ignoble death from the church's tower and, in so doing, set in motion a family curse that the passage of over 400 years has proved unable to lay. Having pondered this gruesome piece of London history, we make our way to the spot where the Great Fire of London burnt out in 1666. 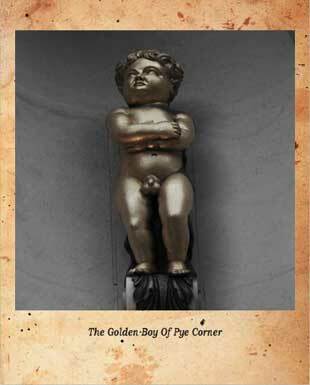 Here we gaze upon an exceedingly curious monument - the Golden Boy of Pye Corner. With their City a smoke blackened ruin, Londoners sought a supernatural reason for their misfortune, and this boy was put up to commemorate the reason they came up with for the catastrophe. 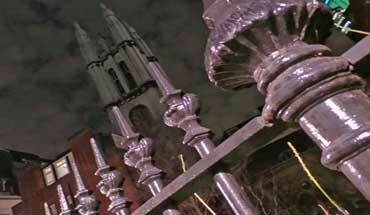 He stands on the corner of the street where London's most infamous haunting occurred. Indeed, so famous had this story become by the 19th century that Charles Dickens himself saw fit to mention it in A Tale of Two Cities. You will make you way to the exact spot on which the strange events of this particular haunting occurred in the 18th century and Richard will act out the full story for you. 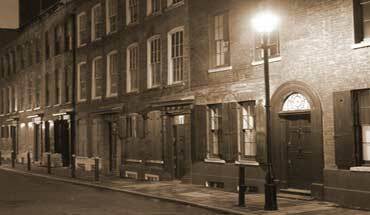 Having been thoroughly chilled to the marrow by these macabre tales, the haunted London walk will move on via some of London's most atmospheric back streets to uncover thoroughfares that have changed little in over a hundred years. You will encounter places where long dead citizens are still known to put in the occasional appearance and where you will just sense that the eyes of former residents are watching your every move. 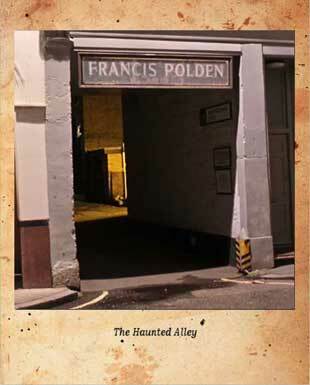 These backstreets will bring you London's oldest hospital to hear of the many ghosts that have, over the years, appeared both within and without its history drenched walls. Chief amongst the unusual and inexpiable happenings is the story of the haunted elevator that has been known to chill the marrow of many a doctor and nurse working the graveyard shift. But this is not the only inexplicable phenomenon that has been experienced at this truly historic location. There's the grey lady that haunts one of the wards, and whose appearances serve to warn staff whenever they are about to make a mistake that might have dreadful consequences. There's the ghostly nurse who comes forth to........ Well, all we be rereleased at the site of her spectral appearances! 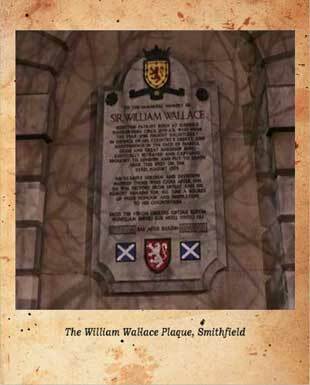 Onwards and forwards, and we find ourselves standing upon the execution ground where Sir William Wallace - Braveheart himself - was so horrifically put to death in 1305. 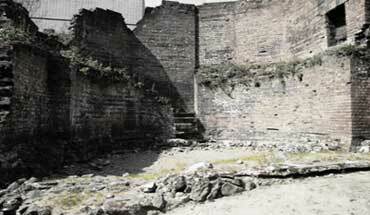 But he wasn't the only poor soul to face the baying mob at this place of ancient bloodshed. Indeed, this sombre spot has borne witness to hundreds of similar executions, the ramifications of which still echo down the centuries in the form of anguished and agonised screams that send shivers down the spines of those late night wanderers who have the misfortune to hear them. Standing on this ancient execution ground, and hearing the horrific details of the suffering that has taken place hereabouts, you could be forgiven should you decide to allow yourself to experience a tiny tremble of apprehension. And, when you learn of some of the other horrible happenings that are known to have occurred on and around this place of ancient infamy - well, let's just say that those slight trembles may well give way to convulsions of sheer terror. Then it's time to step beneath a Tudor gatehouse - a truly stunning structure that dates from 1559 - to enter a tumbledown churchyard where a lone monk is known to keeps a weary vigil amidst crumbling weatherworn tombstones. Whose is the hooded face that has been known to look down on the group from a tiny window pane, besmirched by time? Why does the church's founder feel it necessary to brush silently past surprised visitors? What long ago act of infamy lies behind the ghostly moans that sometimes sound out from the bushes in one of the churchyards darkest corners? Who lies beneath the mossy gravestone around which strange lights are seen to dance from time to time? All of these questions will be answered during your time spent in this truly atmospheric graveyard. And, it might just happen that you become one of those that is singled out by the unknown, and unseen, entity that will whisper your name behind you, causing you to turn around abruptly, only to find that there is nobody there! Hurrying from the ancient churchyard, the tour will make its way via some of the most historic backstreets imaginable to duck into a covered passageway where Richard will regale you with one of his favourite ghost stories of all time. This is a story that Richard has been telling for over 35 years, and one that he has honed to spooky perfection. The art of ghost story telling does not come better than this. Using nothing more than the power of his voice, Richard will transport you back to the streets of 19th century London, where the saga of the white lady will be, quite literally, played out before your very eyes. You will enjoy the art of ghost story telling at its marrow chilling best as Richard elicits cold shivers, nervous glances and even screams of terror from various members of the group. And the story will be told in a tucked away courtyard that will provide the perfect backcloth against which to recount of the long ago events behind a truly chilling ghost story. The final section of the ghost walk is a true journey back in time during which you will wander amidst the ruins of Roman London. Here, the crumbling stone walls are the spectral haunt of a long ago Legionnaire who shows a noble determination to guard this outpost of the empire, despite the fact his comrades departed these shores over 1600 years ago. There is also the sinister bulk of a 17th century plague mound to contend with, where you will hear tales of the horrors of the Great Plague that swept London in 1665. This is a truly creepy spot, made even creepier by the tombstones that cling tenaciously to its overgrown summit. But there is one more surprise that awaits you in the distant corner of bygone London. 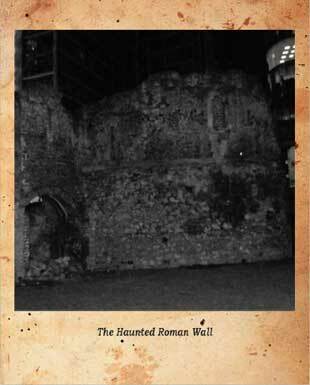 For, many participants who have photographed the old section of the London Wall have, on closer inspection of the image, discovered that a hooded figure has somehow found its way into the picture! What better souvenir could there be of a night spent exploring the haunted streets of historic London, than going away with you own piece of possible paranormal activity to chill your friends with? 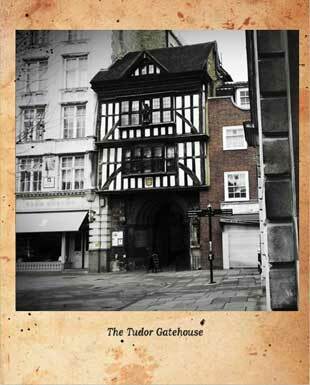 So join London's doyen of the darkness for a walk that is packed with history and hauntings. A tour that will keep you on edge, casting nervous backward glances, ever wary of who, or what, might be shadowing your footsteps on the hidden horrors of Haunted London walk. The Hidden Horrors Walk can be booked as a private tour for your office social, tour group, or even as an outing with a difference for a group of friends or relatives.